Loxwood boss Alex Walsh. Picture by Steve Robards. Alex Walsh feels his first three months in charge of Premier Division-outfit Loxwood has ‘been really difficult but also very enjoyable’. The former-Haywards Heath Town coach was appointed as first team manager at Plaistow Road on October 31 after previous boss Gareth Neathey stepped down due to work commitments. Neathey replaced the long-serving Dave Cocoracchio at the end of last season after he ended a seven-year association with the club. The Magpies had secured just one league win in 11 matches but since Walsh’s appointment, they have picked up four wins and a draw in 13 games. The Plaistow Road-outfit are now just a point away from the relegation zone and are in touching distance of safety. 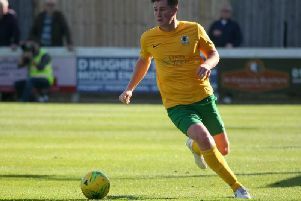 Walsh freshened up the squad by adding seven new faces to a youthful team and the new charges saw a gradual improvement in Loxwood’s form. Reflecting on his first three months at the helm, Walsh admitted that he had a huge task on his hands to turn fortunes around but was proud of the position that they now found themselves in. He said: “I’m not going to lie, it’s been really difficult but also very enjoyable. “It’s a big job the fact that we’ve had to get players in and pick up people’s morale and confidence. We were quite adrift of safety and now we’ve got ourselves right back in contention. “It’s been really enjoyable. Everyone at the club has been really positive and I enjoy it every single week. During Walsh’s reign the club has experienced varying fortunes. From November 17 to December 22 the Magpies went on a five game unbeaten run, picking up three victories during this spell. The highlight of this stretch was Loxwood bludgeoning 11 goals in two games in back-to-back wins over Arundel and Little Common. Despite this good run, the Magpies have just one victory since Boxing Day, the nadir being their 6-0 away loss to Pagham on January 26. Looking back on the ups and down of his tenure so far, Walsh was proud of his side’s wins away from home but felt the Pagham defeat was ‘definitely the lowest point’. The Magpies boss also paid tribute to club’s work behind the scenes, in particular the way Loxwood marked the 100th anniversary of Armistice Day in their home game against Lancing. He added: “Every win is a highlight and every loss is a low point. We’ve won good games. It’s nice to go to some of the other grounds and win. “Last week the second-half was a low point if I’m honest. To lose 6-0, that’s definitely been the lowest point. The Magpies return to action this Saturday as they travel to Hassocks.